Sid Valley Cars is well known around the Sidmouth area as one of the local taxi firms and we have built up a loyal base of regular customers who call us for their journeys in and around the area. They know they can depend on us to arrive on time and deliver them safely. We also have a number of corporate business customers who rely on us to provide an efficient service. 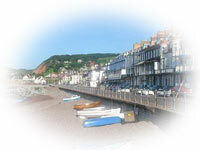 They include East Devon District Council, Sidmouth International School and many Sidmouth hotels. If your organisation is looking for a cost-effective and reliable taxi service, please contact us for a no-obligations discussion. With a taxi, the journey becomes part of the holiday! You arrive right at the entrance to the station, terminal or hotel fresh and with plenty of time to check in. There's no need to worry about how you'll get to the airport or terminal on time; no tricky connections to negotiate; no need to search for somewhere (often distant and costly) to park, and you don't have to heave your luggage about, either. Sid Valley Cars regularly take customers to Honiton and Exeter railway stations, and to major travel centres such as Heathrow, Gatwick, Bristol Airport and Southampton. Door-to-door travel by taxi can often be surprisingly cost effective – and certainly more comfortable – especially when two or more are travelling together. We are happy to take people direct to their holiday destination and recent such trips we've done include Cardiff, Bury St. Edmunds and Moreton-in-Marsh. Unlike public transport we can be very flexible about the journey, enabling you to stop for refreshments or even visit a friend or tourist attraction on the way. How can you have a day out when you haven't got a car? It's simple: call Sid Valley Cars! There are plenty of delightful places to visit around Devon and beyond, and taking the taxi will make the whole day a pleasant and relaxing experience, without the worry of driving, finding the place or parking. Why not get together with a friend or two and have a great day out? Birthdays, anniversaries, weddings... it's good to celebrate with friends and family. At the end of a happy event, you don't want to be concerned about how everyone is going to get home safely. Give us a call and we'll arrange to pick you up and deliver you to your home or hotel, giving you complete peace of mind and allowing you to concentrate on the important thing – enjoying yourselves! or obtain a no-obligation quote.